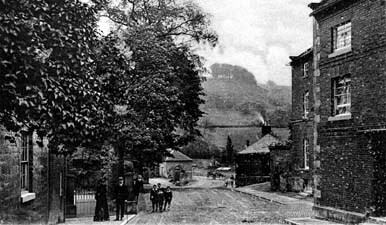 A street scene a little way down Coldwell Street, not far from the centre of Wirksworth, looking towards Newbridge and the railway station.Part of the stabling block lower down the street was pulled down as a result of a road-widening scheme in the 1960's. On the skyline, the clump of trees on the summit of the hill called "The Gilkin". 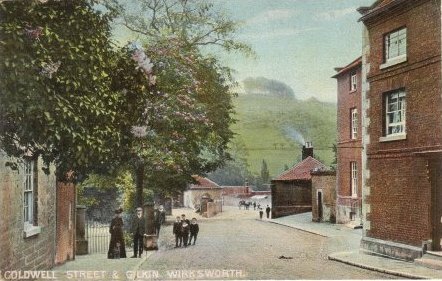 Behind the smoking chimney runs the Derby to Buxton Midland Railway, called "The Wirksworth branch", opened in 1867. A Lady, in extravagant hat and skirts to the ground talks to a man with flat hat and stick. Her dog sits next to her. In the distance stands a horse and trap. Five urchins, with caps, long collars, jackets and boots may be pupils from the nearby Grammar School. All (dog included) are watching the photographer who, with tripod and large plate camera, stands in the road and catches the instant over 100 years ago. King Edward VII, son of Queen Victoria, is on the throne at the head of the British Empire at its peak. Unknown to them all, the Great War is less than 15 years in the future, the urchins probably fought and may have died in the trenches.